I don’t have an affection for basketball the way I do with some other sports. I don’t have a particular team that I cheer for, I don’t have nostalgic memories of playing the game as a kid the way I do with baseball or football. I don’t obsessively follow the season, aside from watching the occasional game or the NBA finals. Which is why it’s personally surprising that NBA2K continues to be one of my favorite sport franchises. Even as someone who casually follows the sport, it’s hard not to appreciate how much care and effort goes into this annual basketball offering. The series has been on a slide for the last few years, over-relying on microtransactions and neglecting their MyCareer mode. But NBA 2K19 has taken the criticisms to heart and clearly made an effort to sand off some of the rough edges that were forming around the experience. It makes for a better game - though there are still some issues holding it back from greatness. I think this might be the best NBA2K has ever played. Previous entries often made me feel unwieldy and tank-like, especially when I was dribbling. It always seemed like defenders were in my face, moving around the court often led to me stepping out of bounds; it was just clumsy. This year there is much greater control over the small movements of the players. I found it easier to see when lanes were open to drive to the rim, I could fight through defenses better. In fact, I was able to push my opponents out of bounds more than stepping out myself. It is a tighter package, befitting of a game meant to simulate the best players in the world. The better gameplay means that it’s easier to implement strategies. Hopping in to help out with a double-team or executing a pick-and-roll are a lot more fun this year. I loved playing the two-man game, having a forward come and set a pick for me and then dishing the ball to the big man once the defense broke down for easy points. It gives you a sense of how to create mismatches for your players and the means to exploit them. NBA2K has always been a game about the stylish flair of basketball, the alley-oops, the step-back jumpers, the fast-break finishers, and this feels like the closest they’ve come to delivering on the empowering vision of ball control. Another great example of this is the new Takeover meter, which measures the play and notes when someone is on fire - basically allowing them to dominate the game until the opposition comes up with a few stops. Another point in NBA2K’s favor is in the tech. There are still issues. I had a couple of annoying crashes and a few cutscenes still have some of the weird visual bugs the series is famous for - though they’ve always been more funny than game-breaking in my opinion. But the crushing loading times of previous games have been improved significantly, getting in and out of games has never been faster or smoother. Given that NBA 2K19 is looking for you to play multiple seasons in your league, career, or grind out hours with MyTeam, it’s great that they’ve sped up the process by eliminating how long you’ll have to wait. The game also looks great. 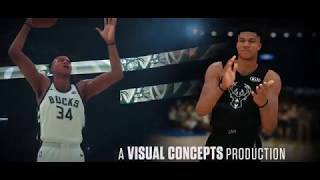 Whether it’s the cutscenes in MyCareer mode or the interviews during the games or the play on the court, NBA2K is really delivering an impressive visual experience. 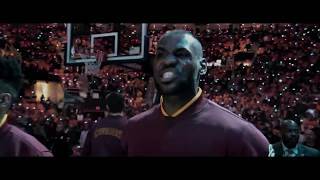 The NBA is an organization with iconic stars who stand out and the title does a good job of capturing that. You can tell when LeBron James, James Harden, or Paul George are on the court with only a quick glance. The presentation features impressive scripted interviews with some stars of the NBA on the court and in-studio, I only wish they would bring in some voice actors who could do the same thing with created players. It would be fun to see rising stars give the same kinds of interviews as current stars. The presentation is still the gold-standard for sports games, from the pregame show to the commentary, it’s an impressive package. I couldn’t say if NBA2K boasts more lines of dialogue than any other sports game, but the rotating cast that joins Kevin Harlan in the booth and their organic-sounding banter is what makes the game stand out. There’s also been an obvious effort into improving MyCareer, which is a step up over last year. Taking a page out of Madden’s Longshot mode, it tells the story of one player’s hard fight to get to the NBA. The game follows A.I., a player who made the leap from college too early, fails to get drafted and ends up playing in China to try and raise his profile. As he plays overseas and in the NBA’s G-League, more and more scouts take notice, but A.I. has to overcome being his own worst enemy. Saying this is a vast improvement over last year’s MyCareer doesn’t quite do it justice. After you’ve completed the story in MyCareer, it reverts to the more familiar set up of training, playing games, and improving the player. The Neighborhood makes a return here, but thankfully it’s much improved. The layout is much tighter, with buildings being clumped closer together, so there’s less wandering around and less travel time to get where you want to go. The microtransactions have been toned back as well. Certain actions like changing your hairstyle don’t cost the in-game currency anymore, allowing for more customization options. You also build up currency during the story mode, where you can’t make any changes, so by the time you get to the pros you have a little cash to start with. While this is definitely an improvement over the last couple outings, it’s still far from perfect. It’s easy to burn through in-game currency quickly while trying to make basic improvements and the teammate grading system that’s used to determine how well you play during games is still finicky - docking you for bad defense when an inadvertent screen leaves your man open, and other annoying quirks. MyGM is a real mixed bag. 2K18 introduced a story to the MyGM mode and it continues this year. Last year’s story was pretty forgettable, so as returning characters appeared, it took a while to jog my memory about who they were. But while last year’s characters were forgettable, this year’s characters are atrocious - for that matter, all of the writing is atrocious. Sports games always have trouble with writing, but NBA2k’s MyGM seems to be sorely missing an editor. There are pages and pages of dialogue in MyGM mode, huge chunks of boring, bland monologues that are begging to be skipped through. It also takes forever to get going. The game spends nearly a half-hour setting up your staff (who you don’t get to pick) and talking with the owner, giving you little to do. And just when you think you’re through the worst of it, you’re bombarded with another bloated chunk of dialogue. Luckily, you can just play vanilla GM mode and skip the story (I would strongly encourage this). And once you start actually playing the mode, it’s a lot of fun. Things move a lot faster with the quick load times, so it’s easy to partially sim games and jump in whenever you need to. I experienced less busy work with fewer player complaints in between games which keeps the mode moving along at a nice clip. Once you’re done with the lame cutscenes, it’s the same balance of decision making and gameplay that’s always made MyGM one of my favorite versions of a franchise mode in sports games. Lastly, there’s MyTeam, NBA2k’s version of card collecting team-builder that you’ll find in many sports games these days. This mode is generically fine, if a little too busy, overloading you with options and lacking the streamlined aspects this year’s Madden had, but overall these things are pretty standard and NBA2K doesn’t do anything painful to mess it up. You grind through games, collect cards, and participate in online challenges and tournaments. If you’ve burned through all the other content, this is a fine way to try and squeeze out everything the game has to offer. The online play in NBA2k is pretty good. Playing games as an individual player can sometimes be a little rough, like when you’re jumping into MyPark with your MyCareer character and as a basketball sim, MyPark isn’t always conducive to constructive team play. Sometimes things devolve into players running around, blindly calling for the ball so they can try to go 1-on-1 and score. There are systems in place to encourage teamplay, but they are ignored as often as they work. Also having more players means that the game has to try a little harder to avoid framerate issues or other connectivity problems. I didn’t run into a ton of these, but they’re more prevalent here than in other online multiplayer experiences. Playing online in MyTeam or exhibition play is better. I rarely ran into connection issues and the speed of the game continues to be strong. NBA 2K19 is definitely a step in the right direction for the series. It hasn’t quite captured the excitement I had for the franchise a few years ago, but if you’ve been disappointed in the last couple of years, this one is a nice improvement. 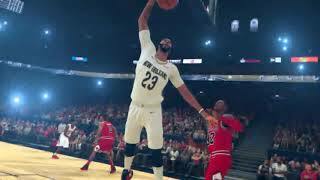 The game doesn’t quite have that swagger back; it still has yet to deliver on the promise it showed years ago with MyCareer mode, and the MyGM story is about as painful as any game writing I’ve seen, but once you’re in the moment, playing the game and nailing step-back threes or delivering a slam dunk off of a fast break, those issues fade away and you remember just why this series is so good. Every other franchise should take note of how good NBA2K’s presentation is, even with its weird bugs. This is the best the series has played in a long time. It’s still not perfect, but 2K19 has improved on the clunky movement of previous entries. The story in MyCareer is definitely a marked improvement, but MyGM’s story is just awful. Luckily, you can just skip and play the regular GM mode. I found playing the Pro-AM and MyPark to be a bit more lag-prone than playing MyTeam multiplayer games, but it’s solid overall. The improved load times are a huge bump for NBA 2K19, but there are still some visual bugs and crashes. It’s nice to see NBA 2K19 working to get back to being a powerhouse franchise. This year’s MyCareer mode is titled The Way Back, and it feels appropriate for this latest entry - the first step in climbing its way back to being the best.